What makes Burmese Teak an excellent alternative to Ipe? Although not quite as durable as Ipe, Teak has long been appreciated by the boat-building industry because of its remarkable water-resistant nature. Of course, that same quality makes Teak an excellent choice as a decking material. With its golden brown coloring, Teak is finding its way into the high-end decking market for both private homes and public venues. Teak’s appearance is one of the many highly valued characteristics of the species. When it’s freshly machined, it can reveal a variable grain pattern, but with environmental exposure, the streaks mellow over time. Highly consistent vertical grain Teak is popular for both boat-building and decking purposes, partly because of its consistent appearance, which makes it easy to match across large surface areas. At J. Gibson McIlvain Lumber, we carry a large inventory of First European Quality (FEQ) Teak, all of which has a consistent coloring and grain pattern. Appearance is only one of the many prized aspects of this species: Strength, durability and stability are major ones, as well. 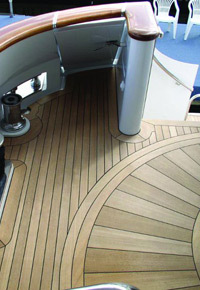 Heightened by vertical grain, the strength of Teak makes it ideal for flooring and other abused surfaces. Even when fully submerged in water, this species is highly durable and water resistant, due to the silica content that comes from the sandy soil of Myanmar, where Teak trees grow. This natural resilience is less apparent in plantation Teak, so J. Gibson McIlvain Lumber stocks only responsibly harvested old growth Teak, all sourced from Southeast Asia. The silica content of Teak is complemented by natural oils that also help the wood repel insects. Teak responds to machining well and holds its shape without a problem. Such stability is important to boat builders and deck builders alike, who know that their products will take a beating from the elements. While Teak grows in many nations (including India, Indonesia, and Cote d’Ivoire), the standard is Burmese Teak. Issues with importing Burmese Teak have made this cream-of-the-Teak-crop difficult to source. The Myanmar government has recently transitioned from a military leadership to a more democratic form of government, causing a lift in sanctions by the European Union, followed by a lift in sanctions from the US also. On the down side, Teak prices promise to climb in the wake of this new regime. Other issues impacting availability include the 2011 erection of the new Burmese parliament building, using a large amount of Teak. As one of the nation’s largest suppliers of old growth FEQ Teak, J. Gibson McIlvain continues to keep an eye on the every-changing logistics of sourcing this valuable species. 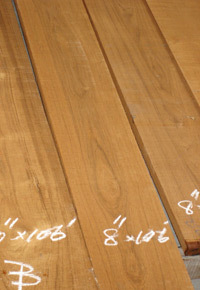 We currently continue to carry many sizes, including boards over 24” wide and topping 20’ long. If you’re looking for an attractive and resilient alternative to Ipe, Teak continues to be an excellent choice.